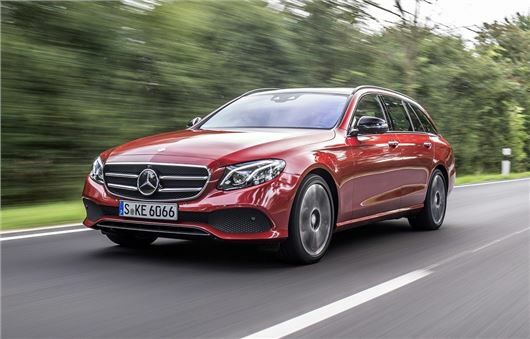 Mercedes-Benz has added the 150PS 2.0-litre diesel engine to the E-Class Estate range. The 200 d lowers the E-Class' entry-price to £36,735 and is available to order now. The E-Class Estate 200 d costs £1200 less than the more powerful 220 d, but is slightly less efficient, returning an official 109g/km of CO2 and 65.7 mpg. In comparison, the 194PS 220 d - which uses the same four-cylinder 2.0-litre diesel engine - provides the same CO2 rating, but manages 67.3mpg. Standard specification on the 200 d SE is the same as the 220 d SE, with 17-inch alloy wheels, Garmin navigation, LED headlights, roof rails and heated front seats. Parking sensors, rear view camera and powered tailgate are also included. As well as a new engine option, all E-Class Estate models are now available with optional folding seats in the boot for children. Priced from £1250 and designed for those under four foot in height, the leather, rear-facing seats expand the E-Class Estate into a seven-seater and store neatly under the load compartment floor when not in use.